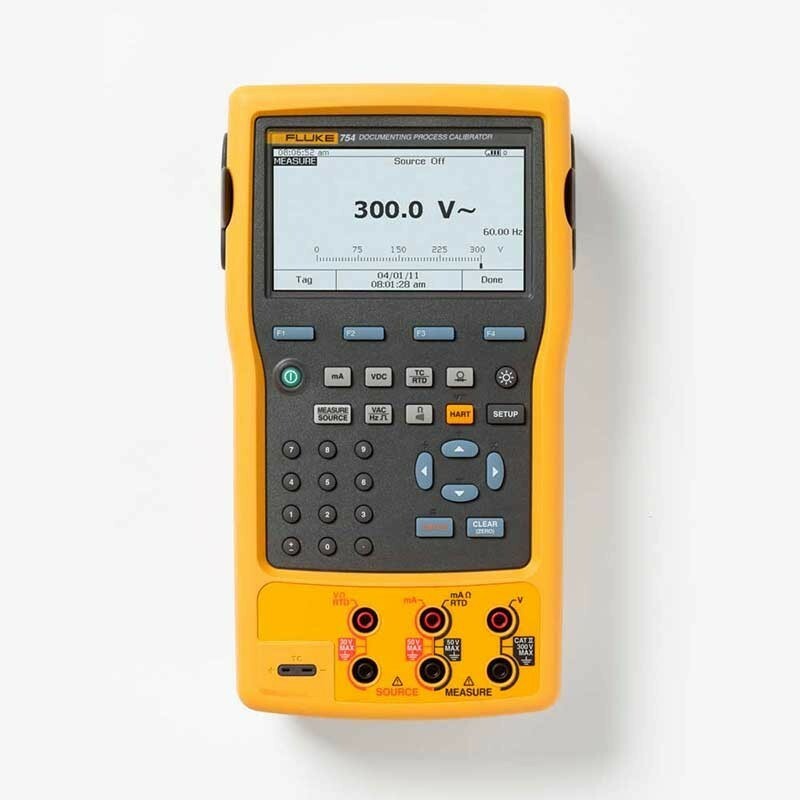 Includes: BC7240 battery charger, Li-on BP7240 battery pack, DPCTrack 2™ Sample Software, Fluke 754 Instruction manual, NIST-traceable calibration report and data, Three sets of TP220 test probes with three sets of “extended tooth" alligator clips, Two sets AC280 hook clips, C799 Soft Field Case, USB communication cable, Fluke 754HHC HART communications cable. 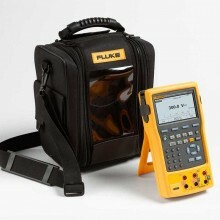 The Fluke 754 is a power multifunction documenting calibrator that lets you download procedures, lists, and instructions created with software-or upload data for printing, archiving, and analysis. 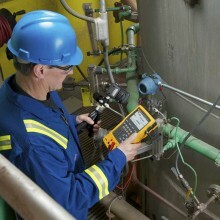 The Fluke 754 also features a powerful built in HART interface capable of performing nearly all the day-to-day tasks you now perform with a separate communicator. 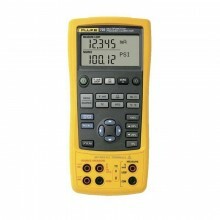 The Fluke 754 is everything you needed and wished for in the Fluke 744 and more! HART communication capability is combined to deliver an integrated communicating calibrator. 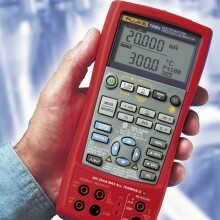 This rugged, reliable tool is ideal for calibrating, maintaining, and troubleshooting HART and other instrumentation. 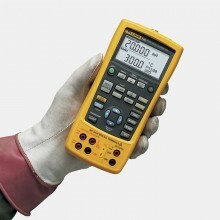 The Fluke 754 is designed to take on nearly all the day-to-day tasks you now perform with a separate communicator. 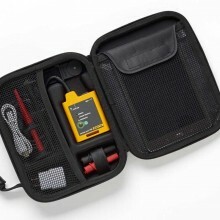 In fact, it offers most of the communication capabilities of a HART communicator. 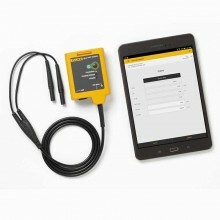 The Fluke 754 works with the Fluke DPC / TRACK2 software, and with popular programs from Honeywell Meridium, Emerson, Cornerstone, Yokogawa, Prime Technologies, Intergraph and others. It allows you to create procedures, instructions, and action lists to deliver fast, easy documentation. Supports popular models of HART transmitters. Read and write HART configuration functions. 100.000 mV. 0.02% + 0.005 mV. 0.03% + 0.005 mV. 3.00000 V. 0.02% + 0.00005 V. 0.03% + 0.00005 V.
30.0000 V. 0.02% + 0.0005 V. 0.03% + 0.0005 V.
300.00 V. 0.05% + 0.05 V. 0.07% + 0.05 V.
Voltage AC 3.000 V (40 Hz to 500 Hz) / 0.001 V. 0.5% + 0.002 V. 1.0% + 0.004 V.
30.00 V (40 Hz to 500 Hz) / 0.01 V. 0.5% + 0.02 V. 1.0% + 0.04 V.
300.0 V (40 Hz to 500 Hz) / 0.1 V. 0.5% + 0.2 V. 1.0% + 0.2 V.
Current DC 30.000 mA. 0.01% + 5 uA. 0.015% + 7 uA. 110.00 mA. 0.01% + 20 uA. 0.015% + 30 uA. Resistance 10.000 Ω. 0.05% + 50 mΩ. 0.07% + 70 mΩ. 100.00 Ω. 0.05% + 50 mΩ. 0.07% + 70 mΩ. 1.0000 kΩ. 0.05% + 500 mΩ. 0.07% + 0.5 Ω. 10.000 kΩ. 0.1% + 10 Ω. 0.15% + 15 Ω. Frequency 1.00 to 110.00 Hz / 0.01 Hz. 0.05 Hz. 110.1 to 1100.0 Hz / 0.1 Hz. 0.5 Hz. 1.101 to 11.000 kHz / 0.001 kHz. 0.005 kHz. 11.01 to 50.00 kHz / 0.01 kHz. 0.05 kHz. 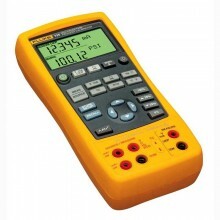 Voltage DC 100.000 mV. 0.01% + 0.005 mV. 0.015% + 0.005 mV. 1.00000 V. 0.01% + 0.00005 V. 0.015% + 0.0005 V.
15.0000 V. 0.01% + 0.0005 V. 0.015% + 0.0005 V.
Current DC 22.000 mA (source). 0.01% + 0.003 mA. 0.02% + 0.003 mA. Current sink (simulate). 0.02% + 0.007 mA. 0.04% + 0.007 mA. Resistance 10.000 Ω. 0.01% + 10 mΩ. 0.015% + 15 mΩ. 100.00 Ω. 0.01% + 20 mΩ. 0.015% + 30 mΩ. 1.0000 kΩ. 0.02% + 0.2 Ω. 0.03% + 0.3 Ω. 10.000 kΩ. 0.02% + 3 Ω. 0.03% + 5 Ω. Frequency 0.1 to 10.99 Hz. 0.01 Hz. 0.01 to 10.99 Hz. 0.01 Hz. 11.00 to 109.99 Hz. 0.1 Hz. 110.0 to 1099.9 Hz. 0.1 Hz. 1.100 to 21.999 kHz. 0.002 kHz. 22.000 to 50.000 kHz. 0.005 kHz. Data log functions Measure functions. 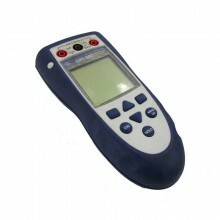 Voltage, current, resistance, frequency, temperature, pressure. Reading rate. 1, 2, 5, 10, 20, 30, or 60 readings/minute. Maximum record length. 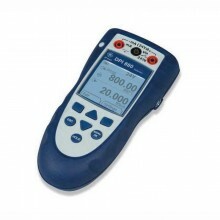 8000 readings (7980 for 30 or 60 readings/minute). Ramp functions Source functions. 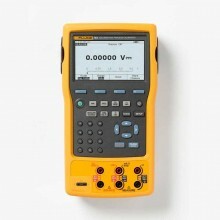 Voltage, current, resistance, frequency, temperature. Trip detect. Continuity or voltage (continuity detection not available when sourcing current). Loop power function Voltage. Selectable, 26 V.
Accuracy. 10%, 18 V minimum at 22 mA. Maximum current. 25 mA, short circuit protected. Maximum input voltage. 50 V DC. Step functions Source functions. 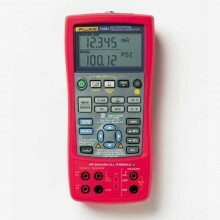 Voltage, current, resistance, frequency, temperature. Manual step. Selectable step, change with arrow buttons. Autostep. Fully programmable for function, start delay, stepvalue, time per step, repeat. Storage temperature -20°C to +60°C. Dust/water resistance Meets IP52, IEC 529. Operating altitude 3000 m above mean sea level (9842 ft). Agency approvals CAN/CSA C22.2 No 1010.1-92, ASNI/ISA S82.01-1994, UL3111, and EN610-1:1993. Dimensions 136 x 245 x 63 mm (5.4 x 9.6 x 2.5 in). Weight 1.2 kg (2.7 lb). Batteries Internal Battery Pack Li-ion: 7.2 V, 4400 mAh, 30 Wh. Battery life > 8 hours typical. Battery replacement Via snap-shut door without opening calibrator; no tools required. USB Connector to interface to your PC. Connection for optional battery charger/eliminator. Data storage capacity 1 week of calibration procedures results. 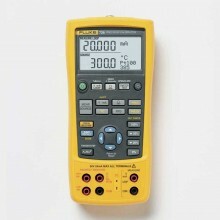 Fluke 754 warranty 3 years. 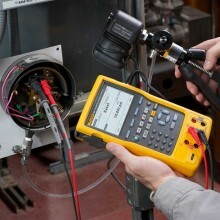 PDF Specifications of the Fluke 753 & Fluke 754 Documenting Process Calibrators.